Compositions By Roland Dyens On tonebase | Learn compositions by Roland Dyens from the world's best guitarists! Browse all lessons on compositions by Roland Dyens. Use the search bar to filter the lessons by instructor, title, difficulty, etc. Born on October 19, 1955, French to perform, compose, arrange and improvise Roland Dyens began his studies at the age of nine. 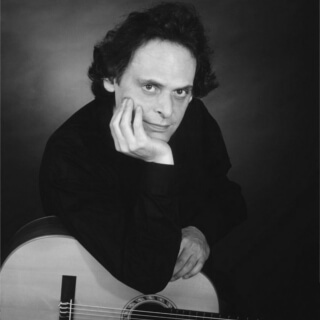 Four years later he became a student of Spanish master guitarist Alberto Ponce and, in 1976, was awarded the Concert License of the Ecole Normale de Musique de Paris. While learning his instrument, Roland Dyens also studied composition with the renowned teacher, composer and conductor, and was awarded the First Prize in Harmony, Counterpoint and Analysis. Among the most distinguished awards obtained during the early years of his career, Roland Dyens received the Special Prize at the International Competition Città di Alessandria (Italy) and the Record Grand Prix of the Charles-Cros Academy, both in honor of the major Brasilian composer Heitor Villa-Lobos.